So I’ve analysed and broken down the best Black Friday Walmart deals and you will find the highlights below along with my tips to ensure you secure the biggest possible savings. (Note: you can find my other Black Friday guides at the following links: Apple (link), Amazon (link), Best Buy (link), Kohl’s (link), Macy’s (link), Microsoft (link), Samsung (link), Target (link) and Walmart (link). Just like Best Buy, Walmart is offering a number of Black Friday 2017 deals which are available right now (see live deals). Below is my selection of some of the best Walmart Black Friday 2017 deals, some of which are available now with the rest launching on November 23rd. This costs more than many 49-inch 4K TV deals on Black Friday this year, but the price of $497.99 is solid for this particular model. Not an actual deal, but stock is rising again for a new console that shoppers want. The fact you can buy it now is the big appeal here. Solid deal all around for this particular model. It is more expensive than some of the other doorbusters being advertised, but this is a better laptop. While this is not the cheapest 55-inch 4K TV (Best Buy has one for $279.99 and Target for $249.99), this one may end up being the best overall deal of the three as it comes from a premium brand. This is not the best TV available this year, but it is the cheapest among the 39-inch and 40-inch HDTV deals. With actual iPhone X offers limited, the iPhone 6 on a Straight Talk Wireless 32GB deal is intriguing. The iPhone 6 remains a solid phone, and it is cost effective if you do not require the new features of the iPhone X and iPhone 8. Prices for premium 65-inch 4k TVs still hover around $1000, and this is one of the better ones from Samsung. Discounts on Apple products are fairly rare, and this is a great price for the 5th Generation iPad. Just released this month, the $100 savings is great for such a new bundle. Walmart stores will start its sales at 6pm local time on Thanksgiving and remain open throughout the night into Black Friday. If there is a big ticket item such as an HDTV, Xbox One or PS4 that you want, you should get in line early before Walmart opens. In addition to this remember on November 14 to check Walmart.com for your local store map. Walmart will post store maps for every one of their locations. The map will include the locations of the most sought after doorbuster items within each store. I recommend studying the map of your store closely to identify the product you want so you can head right to that spot once the doors open without having to look around. 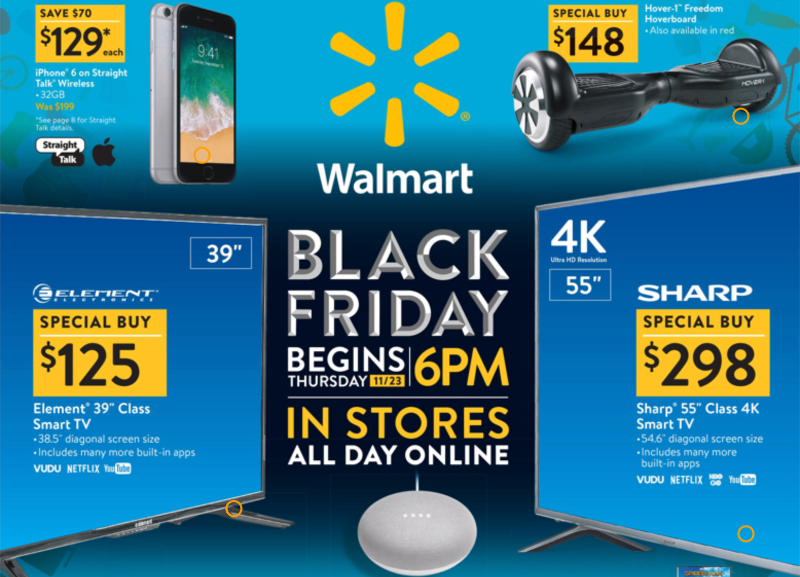 If you are not going to a bricks and mortar Walmart store, you should be prepared to shop Walmart.com online all day November 23th and on Black Friday (November 24th). I also expect some of Walmart’s online deals to begin late in the evening of November 22nd. Lastly, don’t forget to take advantage of Walmart.com’s free 2-day shipping on orders totalling $35 or more. Remember to bookmark my page (or click the ‘Follow’ button on that page to receive email notifications) so you stay up to date with all the daily breaking Black Friday and Cyber Monday 2017 deals this holiday season. Below are links to some of my existing coverage.